The 1929 dress, that is. Do you even remember it? It was the very first thing I was sewing this year but I didn't get very far with it. Yes of course the dress had a, probably perfectly period accurate, too loose shape but I think I can deal with that. The real problem is still fabric. 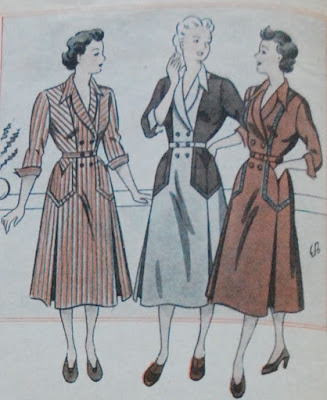 I always struggle to find good (and affordable) fabrics for styles from the 1920's and 30's. It just seems like all those dresses were designed for the finest of silks and wools. Even if I could still find those fabrics, they would be out of my budget. Even rayon/viscose is often hard to find. In this case, I was very surprised by how much I liked the colour I used for the toile. I didn't think about it when I cut into that stuff but that pale grass green really looked good on me. Just a pity that the fabric is a bit too transparent and I've used almost all of it. I've been on the look-out for a fabric for this dress for the past month and my choices seem to be limited. 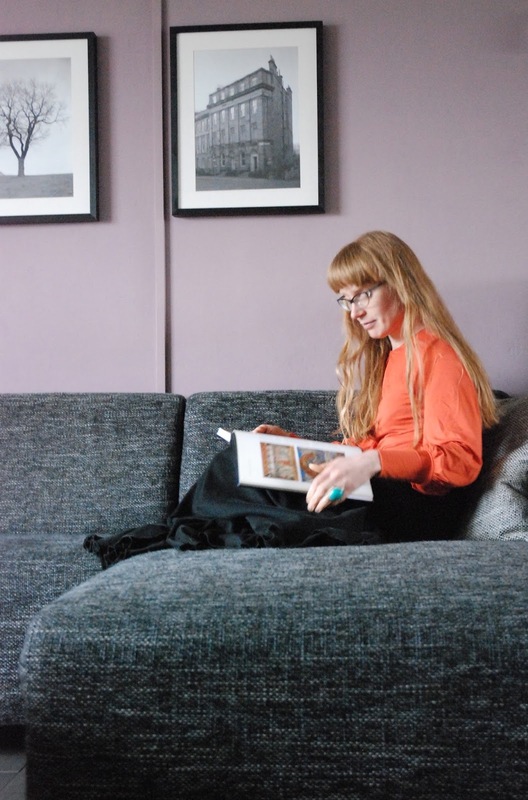 One thing which appeals to me is a very drapey viscose velvet but there are only a few colours on offer right now (there will be more choice again in autumn...): Bright purple, deep dark aubergine, dark green, dark blue, very bright blue and yellow. I can't wear yellow, the bright blue really is too electrically bright, the bright purple just seems wrong for the period, the dark green is too christmas-y and the dark blue would be too severe. I kind of like the aubergine but doubt how flattering this colour would be on me. And whether or not any of these offerings would be anywhere near period accurate. I am not looking for a perfect match here, just for something which would not have been completely out of place back in the day. So, I didn't buy any fabric but I did do a quick search on Pinterest for colour pictures of 1920's dresses. Of course, such a search mostly yields gorgeous examples which were made by the era's great designers and now live in museum collections. It does give some idea of possible colours though. My vague idea that pale colours were popular at the time proved kind of true. 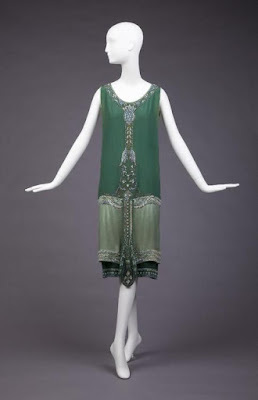 Especially part wear often came in pale hues but it was not all white. There were really three kinds of colours I really liked. Three which I saw a couple of times: Pale greens (like that green I used before), mid blues/turquoise and burnt orange. Fabrics, it seems were often velvets and light silks (often not in shiny varieties). These are shades which could look good with my colouration and I can imagine this dress design in them. So, I guess I will have to look for some nice, drapey fabric in a colour like this. That velvet in the right colour would be really good... I can find stretch velvet in at least that blue but I really worry about how that would behave. May I present my first finished item for the 2016 Vintage Sewing Pattern Pledge? It is not an exciting project by any stretch of the imagination but I think it is something I will wear a lot. 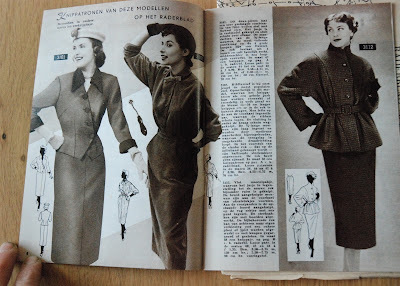 The pattern comes from a German magazine called Beyer's Junge Mode (the "young fashion" edition of Beyer's Mode) from 1956. For me, there is a clear advantage to sewing from a "young fashion" special. More choice of patterns in my size! 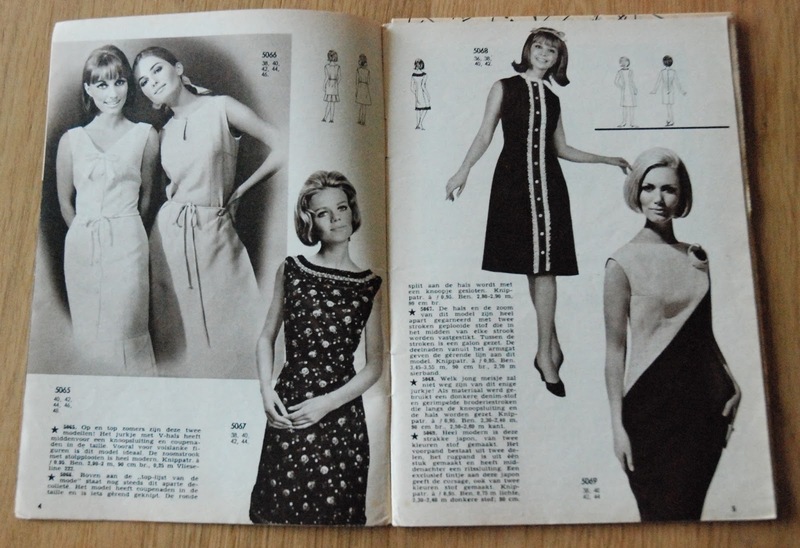 This particular magazine includes patterns for bust sizes 84 to 96. Well, I loved this simple top from the first time I opened the magazine. A simple jersey top with a V-neck at front and back. And in my size! After a bit of stash diving, I found the dark brown cotton pique which I had used to make trousers for climbing before. Fairly thin but strong and not very stretchy AND a super-wide and knitted in the round which made the fabric lay-out for a top only two parts which both had to be cut on the fold a lot less awkward. It is not the most interesting of materials but this was very much a test so that didn't really matter. I didn't make any alterations to the pattern, I just cut about 4 to 5 cm hem allowance because it seemed quite short. When I started sewing it, I stitched the bust darts at an easy-to-remove long stitch length first because I was fairly sure they would be too high for me. At a first fitting, they looked just fine so I stitched them properly. 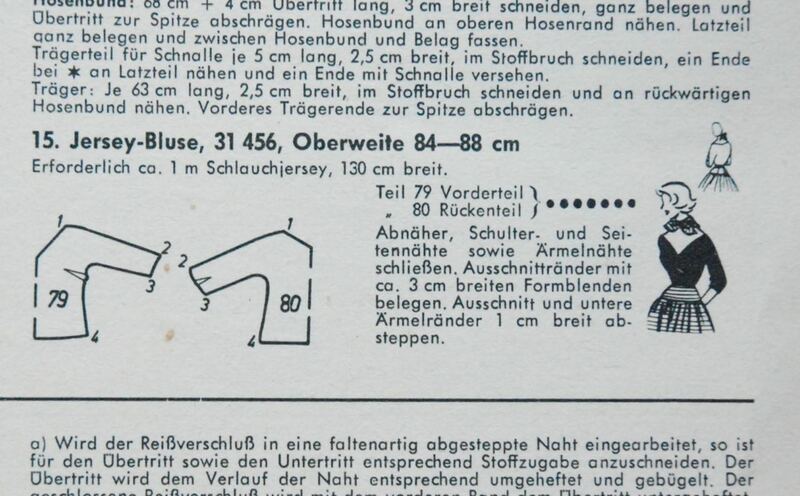 If I understand the instructions correctly, you are supposed to face the neckline and then stitch down the facing. Which is what I did. I have plenty of high-waisted skirts and even some trousers so I think I can put a top like this to good use. In reactions to my previous post (which I also mentioned on Facebook) some people seemed to be a bit surprised about the size of the pattern. Which was for a bust circumference of 112 cm. Obviously, this was one of Bella magazine's larger sizes but not one which was unusual. 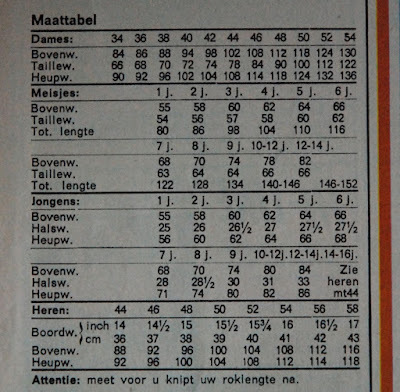 In every magazine, Bella included patterns in a whole range of sizes, with ladies' designs usually starting at 88 cm (although 86 and even 84 are sometimes used in features for teenage girls) and going up to 122 or 124. This didn't mean you could get every pattern in every size, oh no. 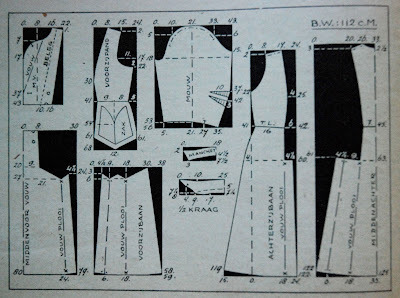 The vast majority of Bella designs was included on the tracing sheet in one size and available through mail order in three sizes (including the one already provided). Bella's sizing is all based on bust size. In fact, the magazine doesn't include any sizing charts. And the choice of sizes is a bit erratic as well. 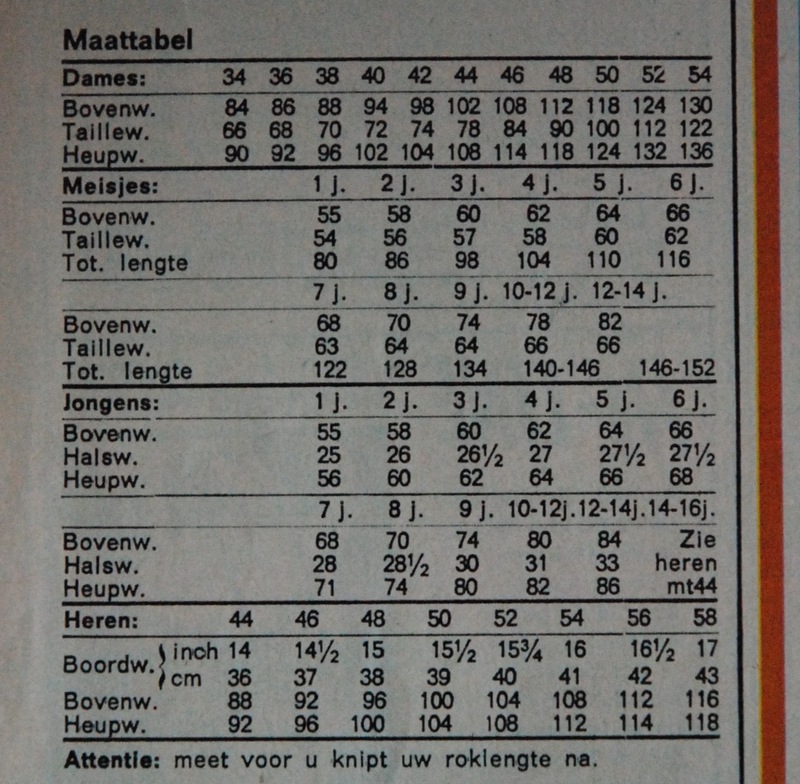 The three sizes in which a pattern is offered are normally apart by 6 cm (instead of the more usual 4) but on the same page, you may find patterns starting at 88, 90 and 92 cm. 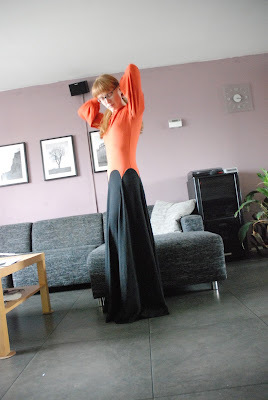 I plan to try and make a simple dress in the size closest to mine soon. That should give me a bit of an idea about the proportions. In Bella, with sizing based on bust measurement and no charts for the other sizes, it is a bit difficult to get an idea about whether or not the sizing changes. And added to that, I only have Bella magazines from the 1940's and 50's so I am not expecting a lot of change in those. 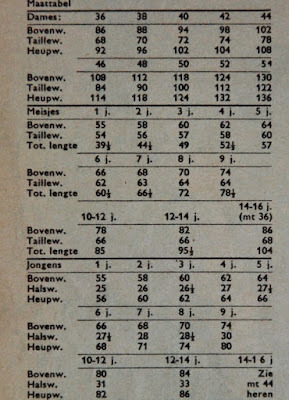 So, in Marion it is possible to chart size inflation in the Netherlands over the past 65 years. The smallest ladies' size used is 38, with a bust size of 88 cm. Bust-to-waist ratio creeps up at the bottom end of the chart with 2 cm per size while the waist-to-hip difference is a stable 30 cm up to size 48 and decreases after that. There is a size 36 but it is the same as the size for girls aged 14-16 and mostly seems less curvy than the 38. Same waist size, smaller bust. 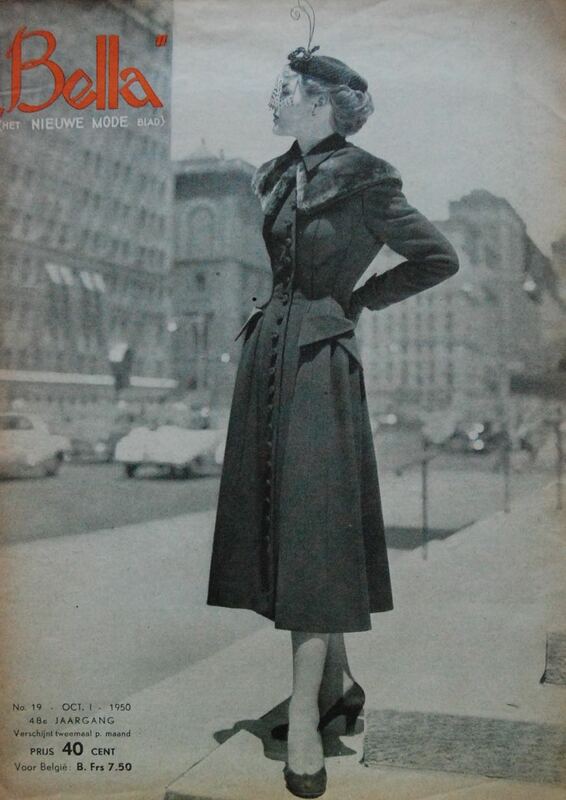 Unfortunately there is no information about the hip size but I don't think I have seen any 1950's Marion designs in that size with narrow skirts so maybe that doesn't matter. Here, 36 has been promoted to ladies' size but keeps the same bust and waist measurement as before, with a hip size of 92 cm. The waist of size 38 has become 2 cm bigger but all other sizes have remained the same. And we have also gained a size at the top end of the chart: 54. And I have to say it now really strikes how much the waist size increases per size after size 46. I suppose that is realistic because the average figure tends to be different in plus sizes than in standard sizes but it is far away from the rather linear grading I am used to for sizes 36 to 44. And this is 1970, just 5 years later. There is another new smallest size, 34, with measurement only just under those of 36. Personally, I don't understand why anyone drafting patterns would bother with a size which is only 2 cm narrower. You could make that from your size 36 pattern by increasing your seam allowances on the side seams by 0.5 cm. The other ladies' sizes have remained the same. In girl's sizing there is a significant change: "Total length" now refers to the height of the child. I guess this was made necessary by the huge variation of skirt lengths fashionable in around 1970. 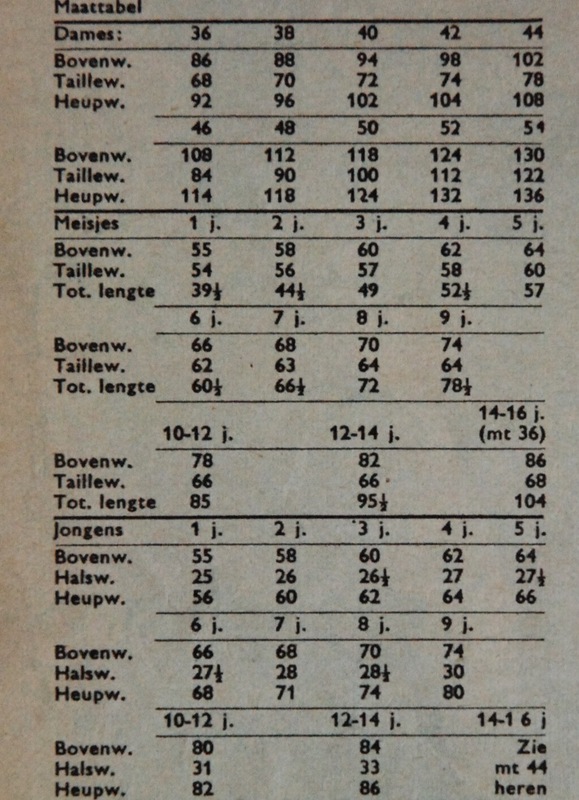 These new length sizes may look familiar to Dutch readers: They are the children's sizes we are used to now. I know Marion magazine was still around in 1990 because my mother used to have a subscription back then. However, the most recent issues in my collection are from the early 1970's. The bust measurement per size has not significantly changed for most sizes (only for the smallest 3 really) but the waists are bigger. At least, for the standard sizes. 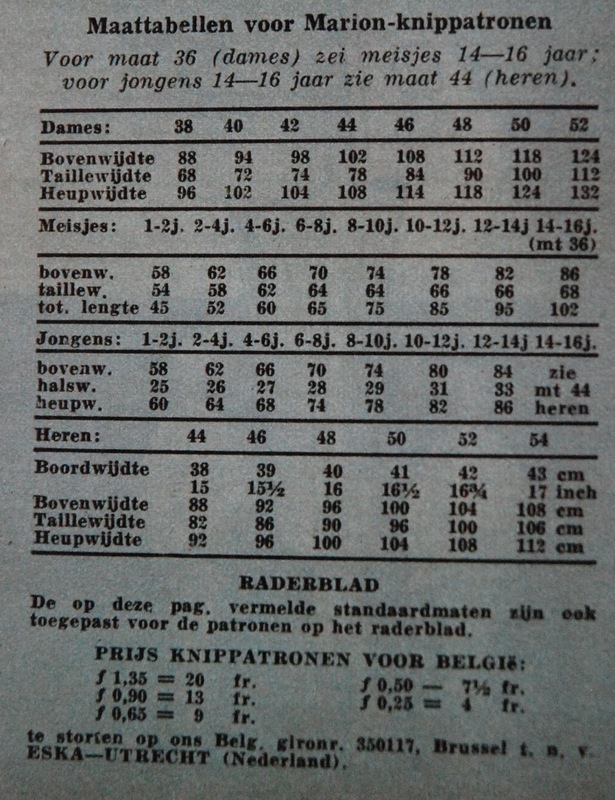 Because that is what stands out most to me: Knipmode uses linear grading so the waist sizes for the largest sizes are smaller than in 1970 (note that there is a new largest size: 56). I suppose this explains why I never feel like the "size 0" debate really applies here. 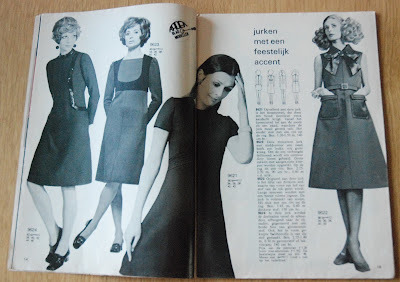 Yes, dress sizes have changed in the Netherlands as well but the differences between different RTW brands and different pattern companies can be as large as those between modern and vintage (especially if you wear, say, a size 42). My sewing for the for 2016 Vintage Sewing Pattern Pledge is going nowhere fast... I may have started even before the new pledge was announced but I still haven't found a suitable fabric for that 1920's dress and I didn't start on anything else either. However, I also promised to share the vintage pattern love by trying to share patterns and projects from my collection. And this is my first attempt at doing just that. This a a "draft according to this diagram" project from sewing magazine Bella. Back in the day, readers could also order this pattern in two sizes from the magazine's mailorder service. 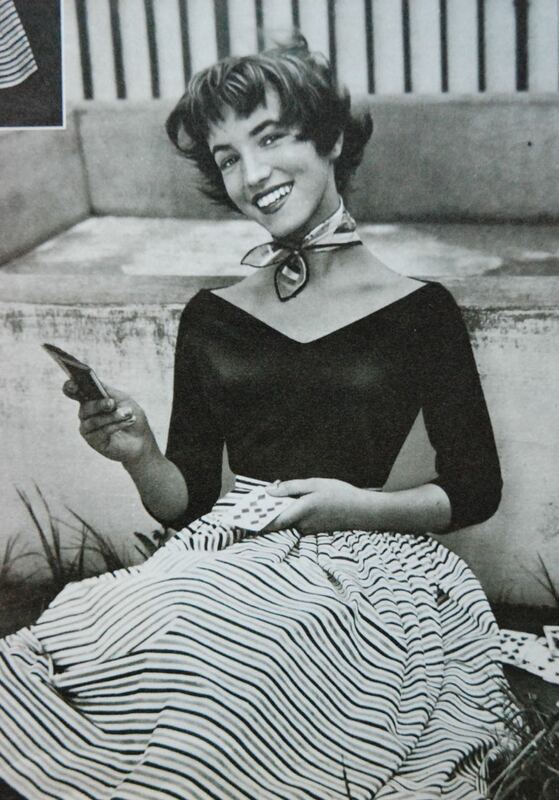 This particular issue of Bella was the first one for October 1950 (it appeared twice a month). The pattern is a ladies' dress for a bust size of 112 cm. I think the design is pretty typical for one from Europe in that year: Chique but practical and still fairly modest in its use of fabric. 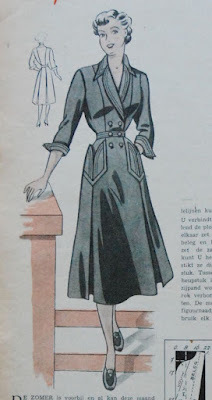 The A-line skirt with pleats would have been very useful to the average Dutch lady at the time: It is a skirt in which you can easily ride a bicycle! Although active resistance to the New Look had died out by spring 1949, many women (at least, according to the magazines which wrote for them) were happy with the overall simpler, narrower and shorter lines of the fashions of 1950. 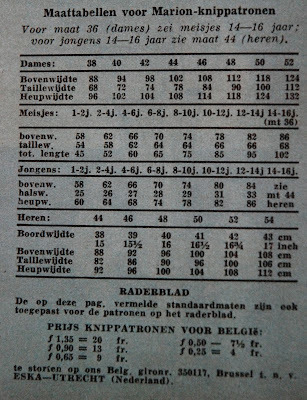 And we shouldn't forget that here in the Netherlands (Bella was a Dutch magazine after all) fabric rationing ended in 1950 and when it did, fabric was still very expensive for most people. In Bella, the "draft it yourself" pattern always came in four different looks with a brief explanation on how to adjust the design for each of them. In this case, the different looks are purely based on fabric choice and trim. But hey, surely we can forgive them for that... The dress has fancy pockets! 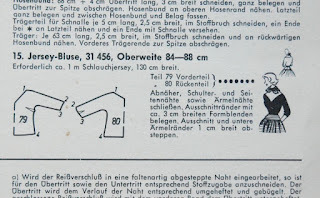 The drafting and sewing instructions are pretty limited but I will give a translation of what little there is. As for the pattern, I am including the original diagram. 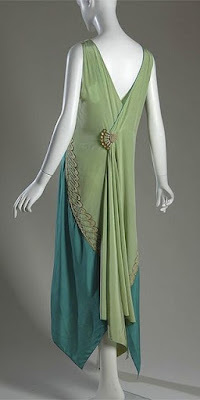 Here we have a dress which will also dress the less slender lady very well and which can be executed in different ways. 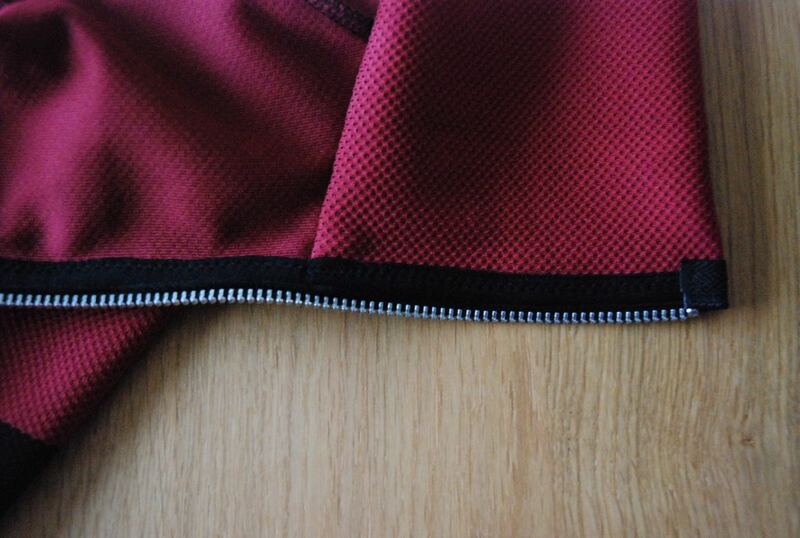 The first picture shows you the dress made up in a plain fabric with nice decorative topstitching. The pattern also offers possibilities for the use of a stripe or check in different directions as well as for the use of two different fabrics. We can only give you one example of each of those options but you can imagine the other variations yourself. In the last drawing, the dress is decorated with an embroidered border along the princess seams and the pockets. Of course you could use braid or some other decorative tape for that. Made up in a plain fabric without nap you will need for this dress, for a bust size of 112 cm, about 3.25 m of 140 cm wide or 5.50 m of 90 cm wide. If you wish, you could add a seam at the waistline. 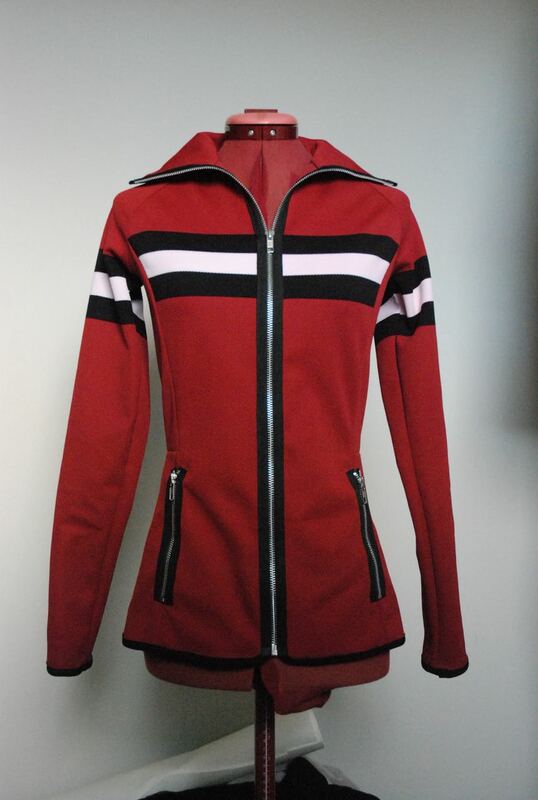 The pattern piece in the top left corner is the center front of the bodice, with the lapel cut on. the fold line is for the lapel. If it is cut along the dotted line labeled "beleg" it forms the facing for that lapel. There is a notch on the lapel which shows where it should meet the collar. the bottom left piece is the center front skirt. It has a full, waist-to-hem length in the middle but the pocket shape is cut away at its side. The pattern piece also contains a quarter of the front side pleat. On the top row, second from the left, there is the side front bodice piece which includes the pocket. 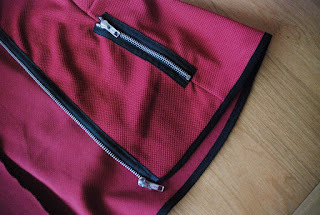 The pattern doesn't include separate pocket pieces but they are drawn in here: I think you should only use the outside shape for the front side bodice and draw those two curved pocket pieces separately. Below it, there is the front side skirt, which included three quarters of the pleat. Then there is the sleeve. It is a shaped sleeve with two elbow darts and markings which suggest that the sleeve head has to be eased in. There is also a notch to indicate where the cuff opening should go. Below that, there are two small pieces. The top one is the cuff. As you can see in the pictures, the finished cuff should have the points sticking out. Then, there is the collar. There is a notch which should match the notch on the lapel. Don't be tempted to draw a sharp corner on the bottom edge of the collar. This a not a shirt collar but a notched collar in a slightly simplified version. It's a curve. The next piece is the side back. 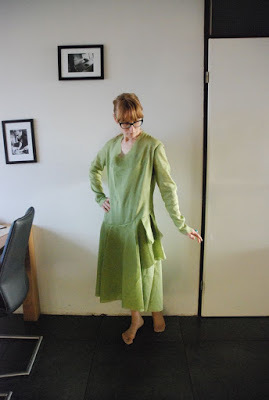 This is a full-length piece although you could follow the suggestion in the text and make a waist seam. This pattern piece includes a quarter of the back pleat. And then, finally, there is the center back piece with three quarters of the pleat. And, as mentioned before, the pattern is for the size which (according to Bella) corresponds with a bust measurement of 112 cm. All numbers are for measurements in centimeters. In those cases where there is a number inside and one outside the black rectangle, the one on the outside refers to the distance down from the top corner, the one of the inside to the amount of centimeters inwards from that height. Take care about marks like the notches and the X-s on the lines where the pleats meet the skirt. Oh, and there is no seam allowance included. It is not mentioned anywhere, but I am pretty sure you should cut both the center back piece and the center front skirt on the fold. You connect (which I think just means sew) the pleats and put X on X. With the pleats falling to the inside, sew together the back pieces. You sew to facing to the center front piece and make the buttonhole. You attach the pocket pieces (you could also make it as one piece) and stitch them onto the hip piece. Between the pocket and the edge of the hip piece, there should be an edge of 2.5 cm wide (not counting seam allowance) The front side bodice is then attached to the center front bodice and the skirt (which suggests you should already have sewn the seam inside the pleat, put the pleat in place by matching those X's and sewn the center front waist seam). Close side and shoulder seams (although I really think you will need something like a side zipper because that front opening is only in the bodice). The sleeve gets to elbow darts which take up 3 cm of fabric each. The bottom is sandwiched between the two sides of the cuff, starting at the notch. When inserting the sleeve into the bodice, ease in the sleeve head. The belt is 104 by 4 cm. It is highly recommended not to add too thick a shoulder pad. I know this is not really a simple project to make from such limited information but if you have experience making dresses and collars and cuffs, it is possible. And if you do, please let me know! Just a little disclaimer: Despite the long wait, the pictures of this dress aren't great. Today was cloudy and actually a bit too dark to take pictures indoors, but indoors is this dress's natural habitat. 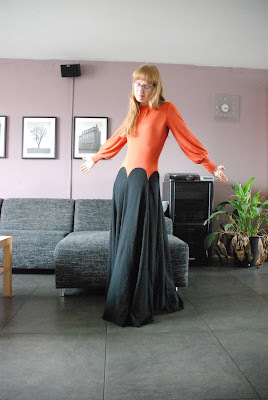 And the orange fabric proved surprisingly difficult to photograph. Anyway, this is the dress I decided to make about two weeks ago. Something very comfortable, in jersey. Something to put on after a long day when you don't plan to leave the house anymore but realize you may have to open the door... So, not a robe, not a nightgown but not a proper dress either. That kind of meant it had to be long. For lounging around, I like warm legs without the need for stockings or pantyhose. And, as I mentioned before, I had some black jersey in my stash which really wasn't good for anything else. I made the skirt, bodice and sleeves as sketched and decided to decide on a neckline at the last possible moment. I rotated the width for the bust darts to the neckline and ended up just hemming the neckline and making tucks for that shaping. I am quite pleased with the dress. It is very comfortable (in fact, I have already worn it on two evenings this past week) and although it is a very different look for me, it is actually quite elegant. Doesn't that look like a real-life version of The Paradise? And real-life, it definitely was! 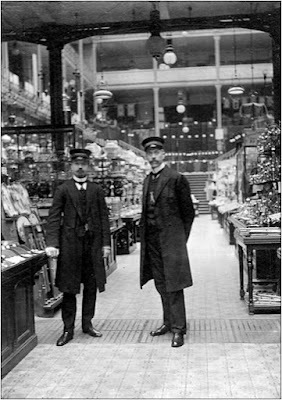 One of the gentlemen in these pictures is my great-great-great-grandfather, who was working at the department store Grand Bazar de la Paix as "Chef de Service". I'm not sure what that job description actually means but it sort of sound like "customer service manager" to me. It kind of suggests he was in charge of something which is likely considering the fact that he held that position when he was about 40 years old. What I do know is the where and when of these pictures. 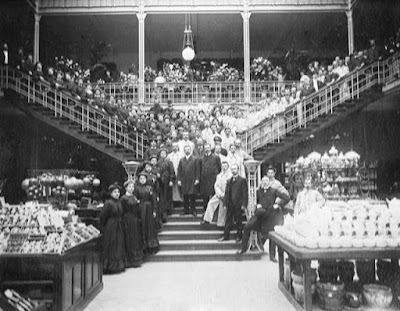 The first one was taken in 1906, on the occasion of the opening of the Grand Bazar, which was the largest department store in the Netherlands at that time. The most recent of the pictures is from 1909. 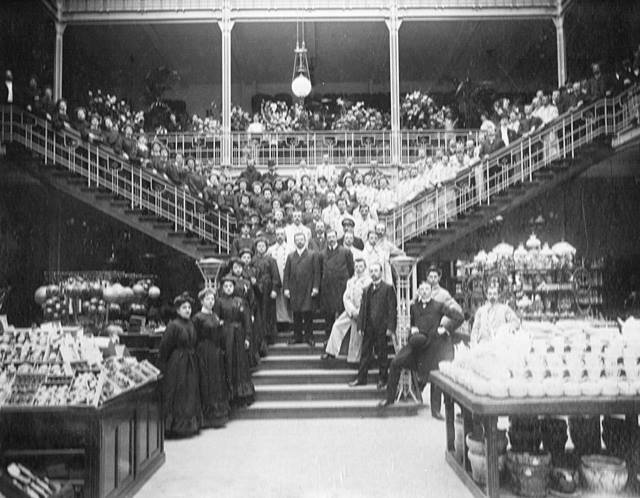 And where was this impressive store? Well, it was literally just around the corner from where I live today! On one of the main shopping streets in the center of The Hague. 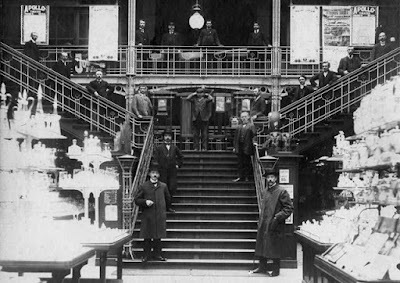 Just across the road from "de Passage" a shopping passage which is still there now. The old building isn't there anymore. There are several buildings along that street (along with the passage) which probably date from around 1900 but on the spot suggested in the information my father found there are much newer buildings.